Next time I'm in the store I'll get brand and model #'s. 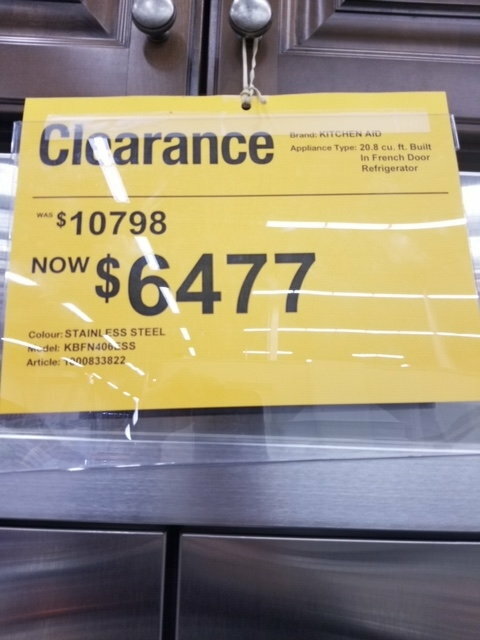 Well I was at the store today and see the high priced refrigs are on sale now..........that's a healthy mark up! And they are probably still making money off of them? Notice it didn't sell at 11K. They can ask whatever they want. Obviously they over reached. That particular fridge can also be had for less btw, you just cant throw in in your pickup that day. Kitchen Aid is the same as Jennair, same manufacturer. A Kitchenaid built in will cost close to $10K. Not at home depot. Different client. High end dealer with a complete installed package, every day. Ironic that it’s right next to the “project loan” billboard. Are you trying to say they don't sell built in Kitchenaid? Let me get this straight. They take off the sides and back of a fridge and quadruple the price? Greatest salesmen in the world. No, you can get them there, but the demographic for home depot is statistically a max 3000 customer for a fridge. I am going off demographics only. Link 'ain't workin'? Usually $8,199 - now $7,379.10 at my local HD. Here's what I found on the local HD site. Gracious, Garett - do you REALLY need this expensive a frig? My first HOME was $12,500! Last edited by Bruce W; 03-17-2019 at 08:39 PM. You can't compare that to a normal residential fridge. The whole thing is completely rebuildable. Basically a residential restaurant fridge. The compressor is on the top behind that panel. Parts are available to fix it easily, not like regular fridges. If you dont get why a 11k fridge is discounted 40% at a big box store, Its not really worth explaining supply, demand, and carry costs for inventory to you. I'm pretty sure you don't understand it, it's not the store, it's the floor model. Maybe you've never shopped a product like this, but when you buy something like this, it's not a pick up discounted item. Oh hell no! And you know what Bruce, it's not really that nice a frig either. 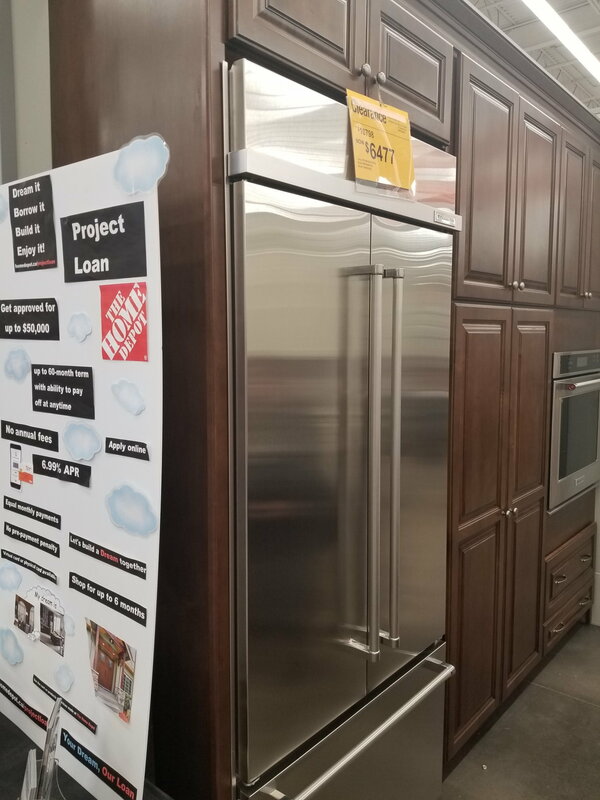 When I posted up the cost of the frig in the first place (original thread) I was slammed for there is no way HD sells a frig for that type of money......well, they do! That's all. I can't imagine buying a high-end built in frig at a place like Home Depot. Well a couple of things come to mind. 1) - at 11k price point I can't see HD having that particular model made specifically just for them to HD's specs.....so that would be a good thing I would think. 2) - I would be inclined to think HD would have a better warranty program in place than your average Mah & Pops store......and that would be a good thing as well. 3) - I know HD will be around in 5 - 10 years time, the Mah & Pops store?????? Have you ever bought one of these and are you familiar with their dealers? You still on the fridge kick? No, I don't have that kind of money. If you can't understand my opening post here and the taring I took on the thread you provided then I can't help you.......carry on.